Bob Von Wolffradt with Governor Branstad and Lt. Governor Kim Reynolds. The state has launched a public-private effort to raise two million dollars to expand community broadband planning throughout Iowa. 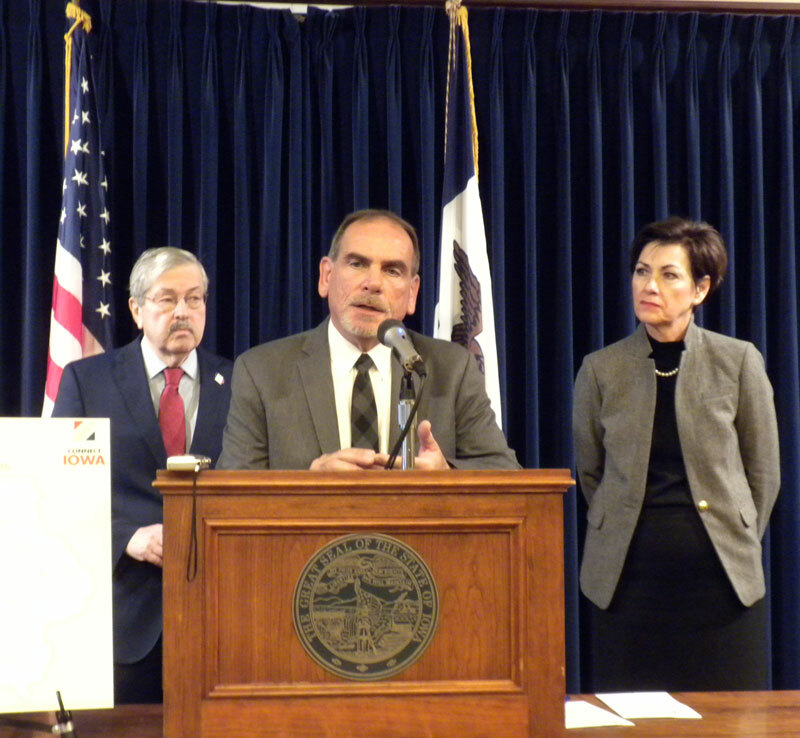 Iowa’s Chief Information Officer Bob Von Wolffradt says the state has been involved in many efforts to increase broadband access across the state, including the “Connect Every Acre” initiative that provided tax incentives. “Which is moving very, very quickly and we hope to publish the projects that were funded under that tax incentive in the next six months or so, so all the citizens can see it,” Wolffradt says. Governor Terry Branstad says this new initiative is designed to build on the progress made with the state investment. “We want to also encourage the private sector to invest in this. And we are very hopeful that we will have foundations and individuals who recognize how important this is that will contribute from the private sector in this as well,” Branstad says. Recent FCC and Census data shows access to advanced, fixed broadband service is available to about one-third of Iowa, coupled with a state broadband adoption rate of just 75 percent. Connected Nation President and CEO, Tom Ferree, says the state is leading the push across the country to improve broadband access. “Iowa is actually being recognized as an archtype in how to use local data to inform where infrastructure investments need to go — so that they make the wisest choices in those limited resources,” Ferree says. Ferree says the money from the new initiative will continue helping communities determine what they need to do to improve broadband access. “It is in support of our connected program where we actually engage at the local level to take data and form action plans that will meet the unique circumstances of each community as it pertains to broadband deployment in the institutions and the various sectors that make up that community’s livelihood,” according to Ferree. Governor Branstad says the “Connected Communities” under the Connect Iowa program have seen the benefits of the plan. He cites the town of Bloomfield as an example of a community that in the 1980’s was worried about its future. “It looked pretty bleak,” Branstad says. “Today it’s a robust growing community in the southern tier of our state and it is an example of what can be done when people work together. And it is one of those connected communities. And we’re encouraging other communities to do like they’ve done, and Woodbine and West Des Moines, and many other communities in our state.” Branstad says there’s also the possibility of some federal dollars from the new administration to help with broadband access. You can find out more about the Connected Community Engagement program at: connectedcommunity.org.